Christian Arana graduated from Georgetown University after studying International Politics and International Development. He spent two years working with Cristo Rey New York High School, a CVN-AmeriCorps program whose mission is to provide an affordable alternative to urban families for a small, quality, value-laden high school. Here, Arana reflects on what it means to be of service to others. As the son of Guatemalan immigrants growing up in Los Angeles, I learned early on from my parents the value of being a person for others. From car rides to school to LA Dodger games, I was given the same speech over and over again: be of service to others. It wasn’t until my graduation from Georgetown University that I truly realized the significance of this message and how my parents had made sacrifices in order to help carry me to graduation day. This notion of being a person for others has guided my service as a college counselor at Cristo Rey New York High School. For the past two years, I have attempted to create educational opportunities for my students, who come from economically disadvantaged backgrounds, and provide sound advice and assurance to their families as well. Through a combination of long hours, creativity, and sometimes just pure luck, I believe I have made significant contributions to Cristo Rey and its students. The results are clear. I leave behind the work and experiences of two successful college road trips that inspired students to attend schools like Franklin & Marshall College and Saint Joseph’s University. I also helped build new roads for Cristo Rey and its students by leading the planning of their annual college fair. It was here where I reached out to the University of Southern California to visit our school and talk to our students. It was here where one of my students found her dream school that she will now be attending. In two short years, I helped 100% of my caseload achieve college access to places like Georgetown, Colgate, Tufts, Holy Cross, and NYU. 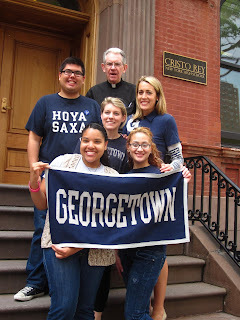 I often remember my first visit to Cristo Rey New York High School as a Georgetown senior and what I learned that day. Unsure of where my life was taking me and uncertain about the paths I wanted to pursue, I first visited Cristo Rey not really knowing what to expect. I went to two classrooms, an English and History class, where the focus that day was on vocabulary and writing a thesis statement for an essay. What struck me about these classroom visits was how the teachers spoke about college as a certainty, rarely using the word if. They repeatedly used phrases such as when you go to college and that demonstrated to me the confidence this school has in its students and in itself. 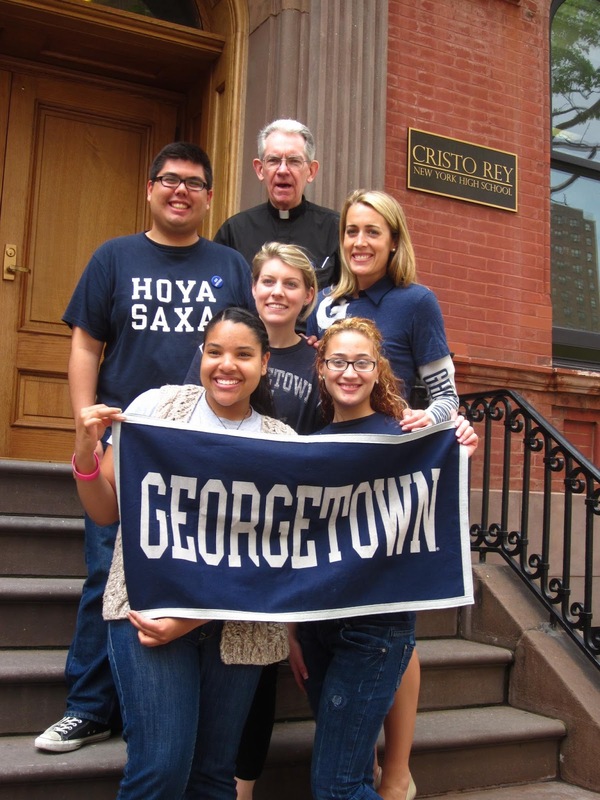 The guarantee and expectation that Cristo Rey’s students were going to college profoundly affected me and inspired me to serve at this school. That, above anything else, is the lesson that I will be taking with me as I move along in my life and in my career. For all of my students, it is never a question of if, but a matter of when. When our students go to college, when our students graduate from college, and when our students become leaders for others—those are the discussions that I was proud to be a part of for these past two years. I hope that in these past two years, I have made Cristo Rey a place that is more welcoming, impressive, and awe-inspiring than when I first entered it. As I go on in life, I am comforted by the fact that I will carry with me the examples of courage that my students and their families have shown me to serve as models for many years to come. The Cristo Rey New York Volunteers aspire to demonstrate the Christian values of social justice, community and simplicity by serving Cristo Rey students in all aspects of their spiritual and intellectual growth.